Pop. 311. In Charlottenburgh T., United Cs. of Storm on Dundas and Glengarry on the St. Lawrence R. and C. Rd. 2, 17 km NE of Cornwall and 8 km SE of Summerstown Station, (pop. 111). Pop. 24. In 1786, 500 Scottish Highlanders led by Father Alexander Macdonnell emigrated to this area from Knoydart, Scotland, and built a church known as the Blue Chapel. Pop. 305. In Charlottenburgh T., Stormont, Dundas, and Glengarry Cs., on the Raisin R. and C. Rds. 17 & 19, 29 km NE of Cornwall. 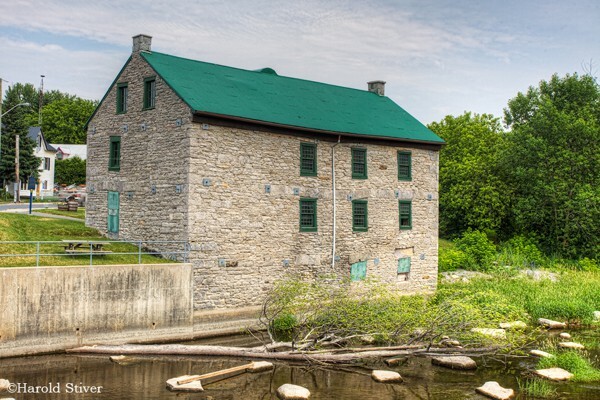 Canada's Oldest Annual Fair is located in Williamtown, about 20 km NE of Cornwall Ontario. Within an hour's drive of Ottawa and Montréal. Pop. 299. In Lancaster T., Stormont, Dundas, and Glengarry Cs., on L. St. Francis (a widening of the St. Lawrence R.) and C. Rd. 2, 30 km NE of Cornwall. Pop. 673. In Cornwall T., Stormont, Dundas, and Glengarry Cs., on Hwy 138, 13 km. NW of Cornwall. Pop. 46,802. City in Stormont, Dundas, and Glengarry Cs., on the St. Lawrence R. at the mouth of the Cornwall Canal and Hwys 2 & 138 just S of Hwy 401, 112 km SE of Ottawa and 110 km SW of Montreal. Pop. 824. In Charlottenburgh T., Stormont, Dundas, and Glengarry Cs., on the St. Lawrence R. and C. Rd. 2, 10 km. NE of Cornwall. Pop. 284. In Cornwall T., Stormont and Glengarry , at the junction of C. Rds. 15 and 18, 12 km. NW of Cornwall. An 1862 map shows H. Harrison as a landowner and Henry Harrison as a storekeeper. Pop. 859. 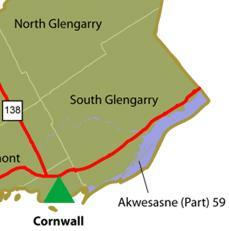 In Cornwall T., Stormont, Dundas, and Glengarry Cs., on the Raisin R. and Hwy 138 and C. Rd. 18, 10 km. NW of Cornwall. Pop. 531. In Charlottenburgh T., Stormont, Dundas, and Glengarry Cs., on the Raisin R. and C. Rds. 18 & 20, 20 km. N of Cornwall.